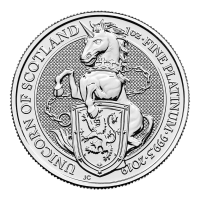 Purchase a 1 oz 2019 Silvertowne Apollo 11 Silver Round at the lowest price guaranteed from our online store! The Apollo Space mission 11 is seen as one of the most remarkable feats in human history. Spanning a five year time period from 1967 until 1972, the objective of the Apollo program was to land an American crew on the moon and return them safely to earth, a challenge set into motion by President John F Kennedy. This commemorative coin marks the 50th anniversary of the fulfilment of this goal. The obverse of this round illustrates the Apollo 11 lunar module on the surface of the moon with astonishing attention to detail, as even the footprints of Neil Armstrong are visible. Encircled with “1969 NASA 2019” proudly displayed as if crowning the round then followed by the rounds 999 fine silver purity and its weight fully boast the obverse of this round. The reverse is adorned by a bald eagle clutching an olive branch touching down on the moon, with the earth in the background and “Apollo 11” features prominently above. 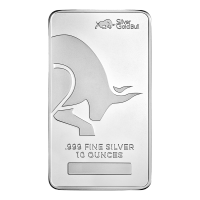 These silver rounds can be purchased as singles, in tubes of 20, or monster boxes of 500. 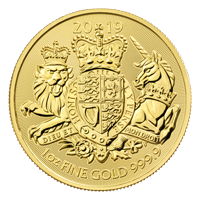 These commemorative coins are sure to go quickly. 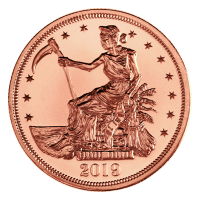 Take a small step towards diversifying your portfolio with this spectacular coin today! Vorderseite Das Mondlandemodul mit Fußabdrücken auf dem Boden. Rückseite Der amerikanische Weißkopfseeadler mit dem historischen Olivenzweig in seinen Krallen und einer halb beleuchteten Erdkugel im Hintergrund. Das Mondlandemodul mit Fußabdrücken auf dem Boden. Der amerikanische Weißkopfseeadler mit dem historischen Olivenzweig in seinen Krallen und einer halb beleuchteten Erdkugel im Hintergrund. 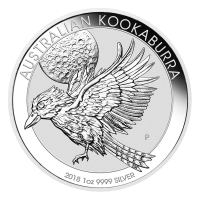 1 oz Silbermedaille - Apollo 11 - Silvertowne 2019 Purchase a 1 oz 2019 Silvertowne Apollo 11 Silver Round at the lowest price guaranteed from our online store! The Apollo Space mission 11 is seen as one of the most remarkable feats in human history. Spanning a five year time period from 1967 until 1972, the objective of the Apollo program was to land an American crew on the moon and return them safely to earth, a challenge set into motion by President John F Kennedy. This commemorative coin marks the 50th anniversary of the fulfilment of this goal. 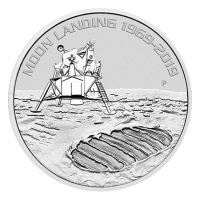 The obverse of this round illustrates the Apollo 11 lunar module on the surface of the moon with astonishing attention to detail, as even the footprints of Neil Armstrong are visible. 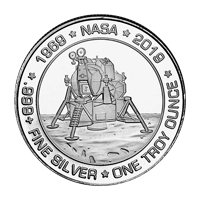 Encircled with “1969 NASA 2019” proudly displayed as if crowning the round then followed by the rounds 999 fine silver purity and its weight fully boast the obverse of this round. The reverse is adorned by a bald eagle clutching an olive branch touching down on the moon, with the earth in the background and “Apollo 11” features prominently above. 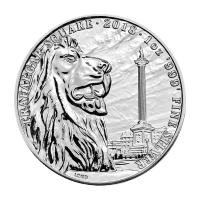 These silver rounds can be purchased as singles, in tubes of 20, or monster boxes of 500. These commemorative coins are sure to go quickly. Take a small step towards diversifying your portfolio with this spectacular coin today!